Sunflora in game: 342 Who? Important notice! 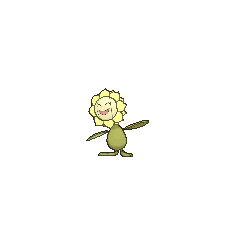 Pokemon Sunflora is a fictional character of humans. Sunflora made its anime debut in Grin to Win!, when the citizens of Bloomingvale held their annual Sunflora Festival. Many Sunflora appear in Moving Pictures. Sunflora also started to appear under the ownership of Nando beginning in A Secret Sphere of Influence!. 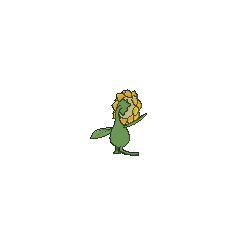 In Three Sides to Every Story!, a group of Sunflora appeared under the ownership of Lulu. A group of Sunflora appeared in There's a New Gym Leader in Town!. Multiple Sunflora appeared in Thawing an Icy Panic!, they were used by Ramos to stop the snowstorm started by Vanillish and Vanilluxe. A Sunflora was one of the Pokémon seen at the Pokémon Swap Meet in Tricks of the Trade. 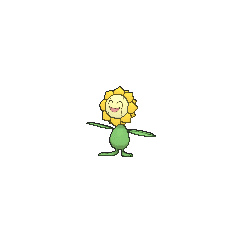 A Sunflora appeared in Beauty and the Breeder where it participated in Bonitaville's Pokémon Beauty Contest. Two Sunflora appeared in the wild in The Grass Route while two appeared in the same episode belonging to Ephraim's parents. 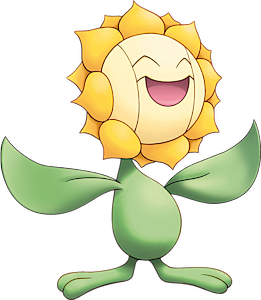 A Sunflora was one of the inhabitants of an oasis just for Pokémon in Got Miltank?. Tammy had three Sunflora in I Politoed Ya So! which were part of her cheerleading squad. Several Sunflora were among the inhabitants of the Dragon Holy Land in Fangs for Nothin'. 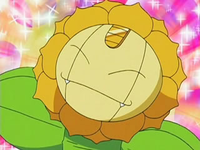 A Sunflora was used by one of the students of the Pokémon Trainer's School in Gonna Rule The School!. A Sunflora made an appearance in The Rise of Darkrai and Arceus and the Jewel of Life. 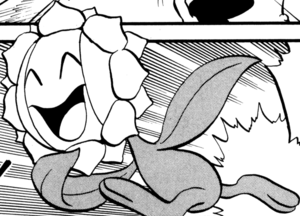 Sunflora appeared in Zoroark: Master of Illusions as a few of the many local Pokémon who lives in Crown City. One of them worked with the other Pokémon in surrounding Zorua to attack him, angry at Zorua for what Zoroark did to the city. Before a fight broke out, Sunflora, along with the other Pokémon, were calmed by Celebi. This concludes the entries from the "Black & White" series. A Sunflora appears in The Rise of Darkrai where it was one of the Pokémon put to sleep by Darkrai. Due to the rocks in Ilex Forest reflecting solar energy like the Sun Stone, Gold's Sunkern, Sunbo, evolves into Sunflora in The Last Battle VI. As a Sunflora, she continues her support role in Gold's party, mainly using Sunny Day to power up Exbo's Fire-type moves. 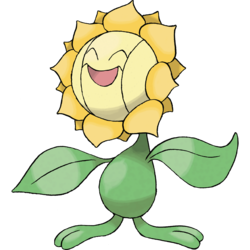 Sunflora is Meowth's most frequently used Pokémon disguise in the anime, being used seven times.